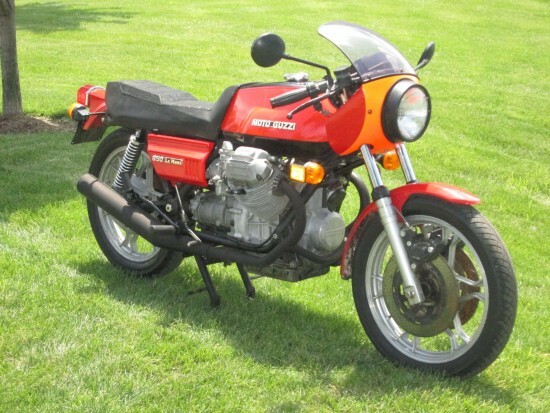 The second Moto Guzzi of the week is this very nice, very original 850 Le Mans. These are often referred to as “Mark I” Le Mans, although that’s obviously a description retroactively applied to differentiate them from later bikes. Released in 1976, it was a logical progression from the V7 Sport in terms of styling and mechanicals. 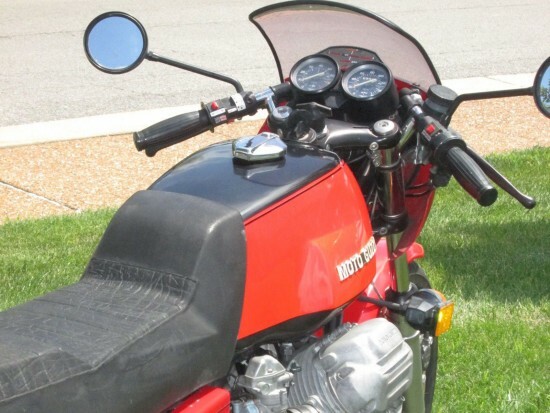 It featured the same basic frame and engine, but bored out to 850cc’s with bigger valves, carbs, and higher-compression, along with new, much more angular bodywork that still displays clear stylistic links to the earlier bike. These changes gave 71hp at the wheel and a top speed of 130. It wasn’t the fastest bike of the period, but it was on par with the competition and included extremely stable handling in the mix. Sure it was quirky, and you can definitely feel the longitudinal crank’s torque-reaction in turns, but it’s easy to compensate for, once you acclimate, and has no negative effect on performance. And with that easily maintained engine and shaft drive, it was weirdly practical for an exotic Italian sportbike. Many Guzzis of the period used a mechanically simple, but highly functional linked-braking system. 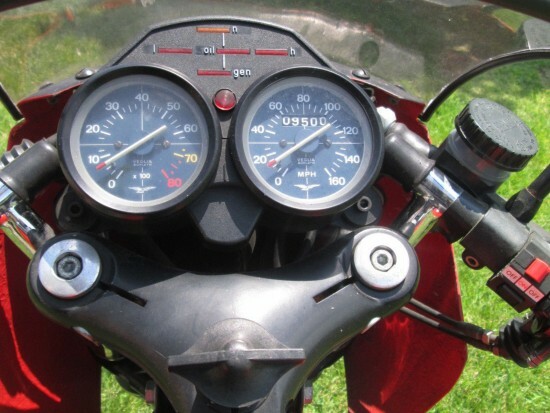 A squeeze of the brake lever operates one front caliper. The foot pedal operates the other front caliper and the rear as well, with lockup prevented by a proportioning valve. Surprisingly effective, although many have been converted to more conventional setups. The listing doesn’t include much detail about this bike, and the photos are a bit washed out so it’s hard to get a good idea about the paint, other than that it has paint. 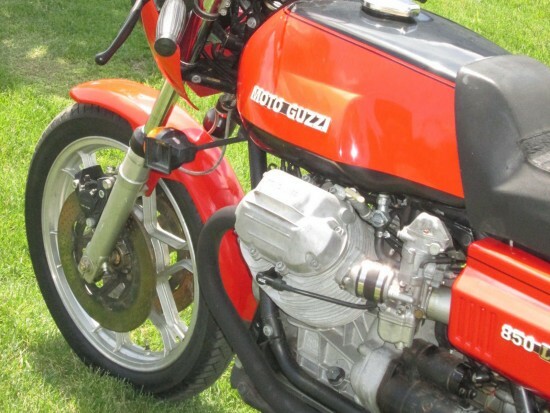 But the mileage is extremely low for a Guzzi and it looks very complete and well cared-for. Owners manual and tools, service records, clear title some minor scuffs and wear but too nice to restore. Only 6000 or so first-gen bikes were made from 1976 through 1978, but most that show up for sale have been well-maintained, and they’re pretty fundamentally rugged bikes. The starting bid is $14,999.00 with no takers as yet. That’s in the ballpark as far as Le Mans pricing goes, and I’d assume we’ll see some activity as we get closer to the auction close. 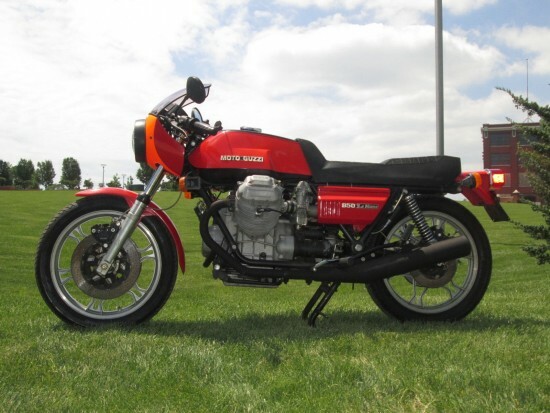 Certainly there are prettier examples out there, but this one’s combination of low miles and completely original condition should make it pretty desirable to Guzzi fans. While the price is certainly not chump change, it’s hard to argue that the Le Mans isn’t still a bit of a bargain in the collector bike world, especially considering that it’s a bike you can ride anywhere and still get parts for, a reliable vintage Italian exotic. 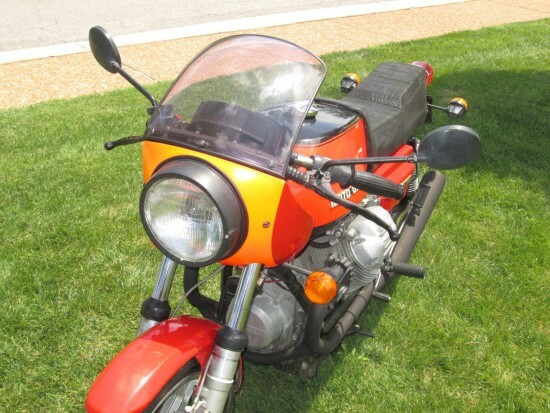 Previous story 1982 Honda CX500T for sale in Ohio with only 8,300 miles!